Local journalism in the UK is in a steep decline. According to Press Gazette, at least half the UK local newspaper journalism jobs are believed to have gone over the last decade, and there has been a net loss of around 200 local newspaper titles since 2005 (around 1,000 are left). 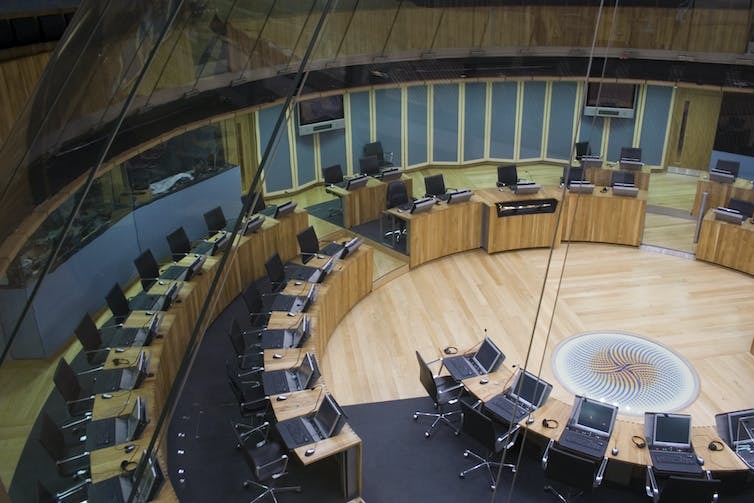 Dave Porter, Lecturer in Journalism, Manchester Metropolitan University, discusses the challenges that arise, and the potentially problematic steps that the Welsh Assembly is considering to address them. The decline in local media has been happening for decades. Commercialism, consolidation, the internet and poor management are all frequently blamed. And yet, though many have tried, no workable solution to reverse these fortunes has succeeded to date. This is not just about informing local people on bin collections, or school fayres: local newspapers have the power to step in and hold councils accountable for their actions. The Grenfell Tower fire is one prime example of how local reporters could have acted on the behalf of their readers. The local press did not pick up on safety concerns aired by residents of the tower block on numerous occasions – notably on a blog written by members of the residents’ committee. A former reporter for local paper the Kensington and Chelsea Chronicle (then Kensington and Chelsea News) told Press Gazette any good local newspaper journalist “would have been all over that story because of that blog”, and that the story would have been picked up a lot sooner in the pre-internet era. But, in a picture all too familiar to many provincial journalists, the Kensington local suffered deep cuts to its staffing levels, to such an extent that the Press Gazette reports that it has only one dedicated reporter for the area. So what can be done to encourage more news organisations to publish the kind of content that – though it may not get the biggest number of clicks – is so vital to the communities they are supposed to represent? In Wales, cuts to local news have become so acute that the country is suffering a democratic deficit. Less than 5% of people in Wales read a Welsh newspaper, which means that they are not being regularly exposed to key issues that are devolved to the country, like health and education. At present, four of the largest regional newspapers in Wales – the Daily Post, South Wales Evening Post, Western Mail and South Wales Echo – are all owned by Trinity Mirror. National news coverage comes from the BBC, ITV or the Trinity-owned website Wales Online. It’s a problem that has reached the highest levels, so much so that a taskforce was launched to see how the Welsh Assembly could better communicate its own news to the people of Wales. The announced recommendation included in the taskforce’s final report was to employ an impartial editor, along with a small team of journalists “focused on producing content about the stories coming out of the Welsh Assembly, packaged in a way that is suitable for digital platforms”. The report further recommended that this content should be delivered as a “distributed digital news service” via social media and other channels, like dedicated email newsletters. We think this service would also provide useful material for the scores of local and hyperlocal news publications around Wales. These stories should be used to draw audiences back to Senedd TV and the revamped assembly website, which will provide homes for archived stories about the place where the Welsh Government is scrutinised and held to account – the National Assembly for Wales. In his foreword, taskforce chair Leighton Andrews, a former assembly minister, admitted the idea was radical. And though the team may have had good intentions in making the recommendations, it still attracted criticism that the proposed service would be akin to government propaganda if implemented. Naturally, councils and other public bodies will want to promote good news and deflect attention from bad news. Journalists, on the other hand, want to question and potentially expose wrongdoing on the part of such authorities. The two functions are at odds with one another. This is an issue as urgent in Wales as it is elsewhere in the country. Quite rightly, the assembly wants to publicise the work of its members and its decision-making process, but who will be there when they go wrong? No team of in-house journalists or press officers is going to be asked to promote a damning report on health statistics or child poverty. It is the role of independent, objective and determined reporters to uncover such issues and bring them to the attention of the public. Put simply, however, newspapers and other media organisations no longer have the resources to send someone to cover every council meeting, court hearing, or even assembly procedure in the way they would have done 20 years ago. In some ways it is a good thing that the Welsh Assembly is recognising the importance of promoting what it is doing. But this idea does not exactly protect the idea of an independent press. Such state-run media will naturally only present one – usually positive – side of an assembly decision. And if this service ends up competing with rather than supporting the Welsh media, who will be there to scrutinise and challenge such decisions? Nationally, councils are advised not to publish their own newspaper-style newsletters to residents more than four times a year. In part this is a recognition of the vital importance of council advertising to local papers but is also to avoid accusations of encouraging media monopoly with “town hall Pravdas”. With a digital service like that proposed in Wales, however, surely there would be no such limit.